AMD officially reaffirmed the release time line for Zen yesterday, confirming that the brand new CPU core will come to high-end desktops in 2016. 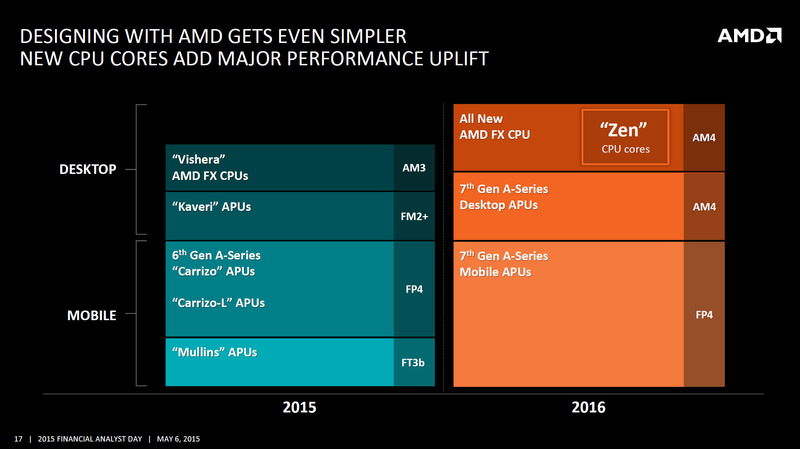 This is only the second time that AMD has officially detailed the market introduction timeline of Zen based products since May of this year at the past financial analyst day in which Zen was publicly announced and detailed for the very first time. 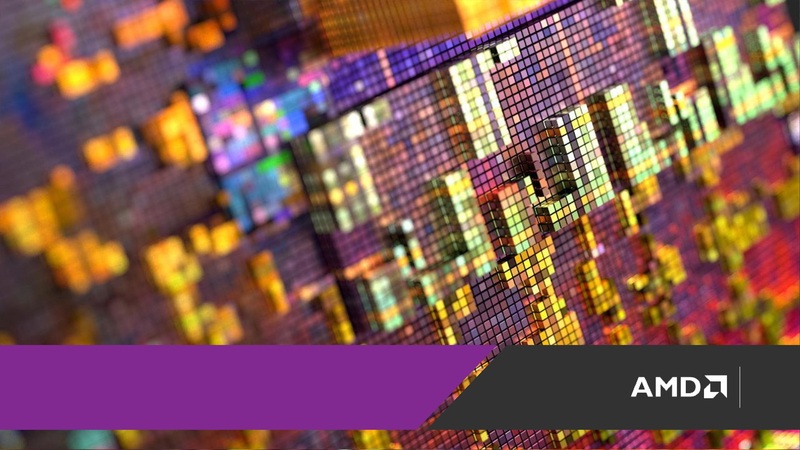 This update comes from the Raymond James Technology Investors Conference which took place yesterday with AMD’s CFO, Devinder Kumar. We discussed everything we know so far about AMD’s upcoming high performance Zen CPU core in an in-depth iarticle very recently, including inside information about exactly when you should expect to be able to buy a desktop Zen CPU, Zen’s high-level microarchitectural design, what sort of performance you should expect and the kinds of features that the new AM4 desktop platform will deliver. If you’ve missed it, or if you’re out of the loop you will want to check it out before you proceed. And then lastly, comment on the longer term gross margin, operating margin goals timing? I think the key is getting through 2016 is to continue to stabilize the computing and graphics business, commercial, professional graphics embedded and even the high-end desktops with the Zen Core should all be accretive from a margin standpoint. I’ll be very disciplined from that standpoint and then obviously get into the 2017, 2018, 2019 time frame, we showed some long range target model assumptions across the board from a gross margin and profit standpoint and I think those are also pretty firm and we expect over the next three to five years we can execute to that, with execution on the graphics side of it, on the data center business, on the embedded and finally the new business that we expect on the semi-custom side of the house. Kumar reaffirmed the company’s plans to introduce Zen based high-end desktop FX processors next year that will bring renewed competition to the desktop space as well as drive margins up for the company and steer it towards more sustainable profitability for the next several years. 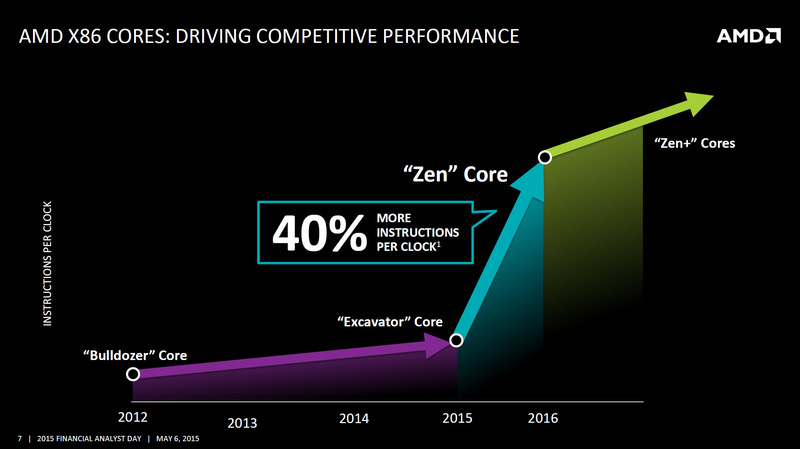 There were questions as to if AMD can deliver Zen products by next year. Rumors of 14nm struggles at Globalfoundires, which have since been debunked, as well Jim Keller’s departure back in September had cast shadows of doubt over Zen’s availability in 2016. Keller re-joined AMD in 2012 after a stint at Apple, and his time at AMD over the past three years was the longest he’d ever spent at the company. He was tasked with leading a team to design a brand new, from scratch, high performance CPU core. Something he has been famous for in the past with the original Athlon and Athlon64 processors, the most successful CPU products in AMD’s history. Back in May AMD’s Chief Technology Officer Mark Papermaster announced that Zen will bring a 40% improvement in instructions per clock over AMD’s previous generation. IPC is a metric which defines the performance characteristics of CPU microarchitectures and 40% is several times higher than what we’ve come to expect from both AMD and Intel in the past several years. That latter of which has only managed to deliver mid single digit IPC improvements with each generation since 2011. While AMD has only managed to improve performance by a marginally better rate at about 10-15% with each generation since the introduction of Bulldozer in 2011. So 40% in this context is quite significant, even if we account for the lower base of performance that Jim’s team had to start from. Zen was a clean sheet design that started a few years ago. We are in the final stage of executing and you know the milestone that you want to hear us talk about is Zen taping out, which should be over the next several months, and then putting samples in the hands of our customers and then starting first full year of revenue in 2017. And by the way, because we have this reuse approach for cores, you will see us with Zen cores in the high-end desktops first and then the servers from our overall products standpoint. Kumar reiterated AMD’s plans for a full year of revenue from Zen based products in 2017 with the initial introduction of high-end Zen desktop CPUs in late 2016, something which we had reported & detailed in an exclusive piece two weeks ago. Following Zen’s introduction into the desktop space, high performance Zen based sever parts will be rolled out. And this will be AMD’s first play into the high-end server market since 2012. In addition to Zen AMD also has 14nm/16nm FinFET graphics chips scheduled to debut next year, so the majority of AMD’s product stack will feature FinFET technology, save for Bristol Ridge APUs. This will bring the company’s product stack to as close of a parity with Intel as we’ve seen in a very long time.